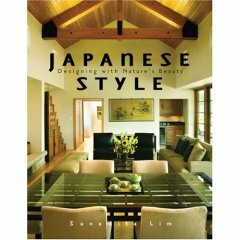 If you are fascinated by the creation of handmade Japanese cabinetry, this is one of the few books you can find on the subject because for some reason, the cabinetry of Japan is one of the least recorded aspects of Japan's woodworking history. Throughout this guide, you will find lush photographs of opaque and transparent lacquered chests, their hand-forged iron handles and the tools of the trade. I especially enjoyed the hand-colored photos of family life, rice fields and the textile sellers. Not only do you get to glimpse this magical world of Zen temples and street merchants selling sweet rice drinks, you will be able to view page after page of stunning merchant chests, bedding chests, clothing chests and mizuya-dansu (kitchen cupboards). I've always been intrigued by chests filled with magical little drawers in which anything could be stored. This book has made me aware of the wide variety of chests that can be purchased and most of the pages are filled with pictures and descriptions so you can know what to look for online. Before finding this particular book, I was at a loss for what to look for. Now I have the names of items like the sea chest (funa-dansu) and realize the difference in the woods used. I think the cho-dansu made of keyaki with the distinctive iron fittings on page 111 is just stunning. The cho-bako funa-dansu (ship chest) is also very interesting as it features tortoise, a symbol of prosperity and longevity. The detailed descriptions of the lockplates are presented with photographs. If you are a student of this craft (or looking for pictures of things like a cherry blossom motif), the pages on the components of a tansu will encourage you to explore all the essential details in your own selections. They also explain how all the L braces and iron-edge strapping are not only decorative, but highly functional. As a person who has refinished a desk upon which I am typing, my appreciation for furniture went through an entire renewal process while reading "Japanese Cabinetry." Not only does this book present early mercantile tansu designs, there are pictures of contemporary desks and even a section about books, magazines and catalogues for further research. The index, glossary of terms and chronological list of exhibitions make this book very easy to read and understand. There are also ideas for how to set up your tansu collection in your bedrooms, bathrooms, living rooms and kitchen. You might even want to put a kitchen chest (mizuya) in your living room. This book also features entry tables, entertainment centers, coffee tables and bookcases and so much more. Back to dreaming of owning the cho-dansu from the late Edo period (1615-1868). Not only can you view items from this period, you can read about the history and lifestyle of the people living in this era. This book would make a perfect gift for anyone who has lived in Japan or is interested in Japanese history. It would also be an amazing gift for anyone interested in Japanese movies. I have often wondered about various items and this book has provided more information than I could have ever dreamed about finding. A note about the authors: David Jackson has been collecting tansu since 1990 and has studied sculpture and woodworking. He developed his passion for Japanese woodwork and then was involved with one of the first exhibitions of tansu in the United States. Dane Owen founded a gallery of Japanese antique furnishings and is also a frequent visitor to Japan. He can be found searching for objects for his customers and his own private collections. 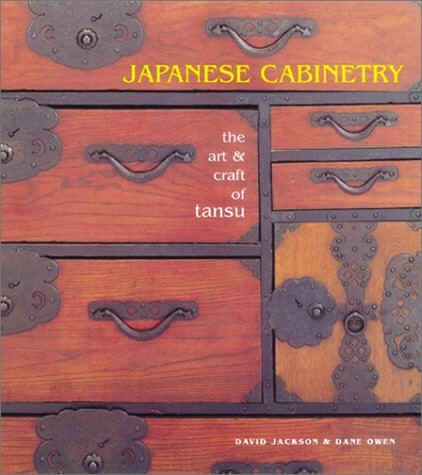 Together they have written the ultimate book on the Japanese craft of tansu. 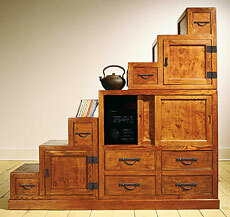 If you love tansu, your heart is going to beat a little faster while reading Japanese Cabinetry. I am beyond appreciative of David and Dane's knowledge of this subject. If you buy one book on tansu, this would be an excellent choice. easy to set up in different ways." After reading Sunamita Lim's beautiful book: "Chinese Style," I was interested to know more about her new book: "Japanese Style." It is equally impressive with warm nurturing spaces created with wood and bamboo. While reading it is easy to imagine yourself wandering along stone pathways or sitting by a pond in a serene Japanese garden. I was intrigued by some of the designs, especially the cabinet made with maple, alder and burl woods. The bamboo gate leading out into a garden also looked inviting. While the gardens are filled with beautiful fountains and stone lanterns, the interiors are filled with soft fabrics, pillows and interestingly patterned rugs. The teahouses are especially warm and inviting and Sunamita Lim's beautiful writing sets a mood for the traditional settings. This is the type of book you want to read while sitting in a comfy chair. Half the enjoyment is reading the well-placed quotes and imagining living in a refreshingly pure and soothing environment. 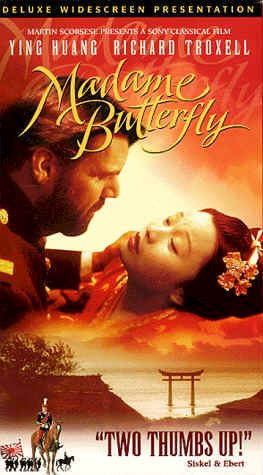 "Madame Butterfly" is an exquisite and faithful cinematic adaptation of Giacomo Puccini's Opera "Madama Butterfly" set in Japan in 1904. It is really a heart-wrenching story of a young geisha who sacrifices her religion, family and life with a more suitable partner, like Prince Yamadori, while she waits for Lieutenant Pinkerton to return. One of my favorite movies of all time!